The Seinoli Legal Centre is the first public interest legal centre in Lesotho. It was founded by Protimos in 2010, in response to direct requests for help from the communities who had been involuntarily resettled in the wake of a huge dam infrastructure programme, Phase One of the Lesotho Highlands Water Project (LHWP). The communities have been forgotten and neglected, living in abject poverty since 1996, deprived of the resources which had previously enabled them to live sustainably. The SLC legal team have negotiated settlements and begun to conduct successful strategic litigation for long overdue cash compensation for communities. Two major battles have so far been won. In 2012 the Legal Centre obtained a court order which obliged the Lesotho Highlands Development Authority (LHDA) to provide access to clean water for the villagers of Mapeleng, after the supply had been interrupted by the construction of the dam. This was after more than ten years of the Authority refusing to take any action. The precedent allowed other communities to pursue similar claims against the LHDA, and there are many more to come. In 2015 the Seinoli Legal Centre represented the Ha Lejone Co-operative. By law this community was entitled to compensation from the LHDA for their brushwood, fodder and medicinal plants which had been lost under the water now filling the river valley at the newly-constructed Katse Dam. After a Lesotho High Court battle the judge ruled that the Co-operative was indeed entitled to this compensation. This ruling has opened up the opportunity for many other similarly neglected communities to seek similar compensation and therefore a pathway out of the poverty imposed by unjust development outcomes. 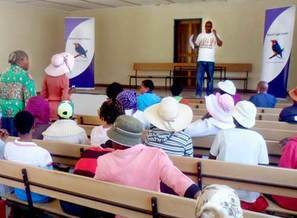 With further funding, Protimos will help Seinoli Legal Centre fulfil its strategic ambitions – to strive for just compensation for many communities in Lesotho, and to teach these communities about the rule of law. Your donations will also help Protimos reproduce the successful and sustainable Seinoli model in other parts of the world, empowering many more voiceless communities through the rule of law. How to give. Sign up to Protimos’ newsletter (email us on info@protimos.org to be added to the mailing list). Follow Protimos on twitter and facebook.